New Math Tricks for shortcut formulas of Arithmetics, Mensuration and Geometry. Fastest, easiest and tricky methods of competitive math with solved questions. We learnt triangle mensuration formulas previously. Today, we are going to solve a few more question answer by perimeter and area formula. If you had not read the previous article on this topic then visit that by clicking below link. Because we have already discussed the following topics before today's tutorials. Look at below for important question and answer. Question1: What is the area of a 20 cm equilateral triangle? 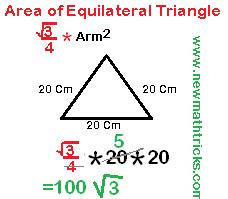 Solution: You know that an equilateral is called which all arms are equal. Look at below image for area calculating shortcut rule and the solution of this type of question. Question 2: A triangle in which arms lengths are 20m, 30m and 40 m respectively. Now find the area. Answer: Here, the figure is isolateral and we knew all arm lengths. Simply we will sue the Heron formula to find the area. Look at below, how we solved problems? We hope, you got the easy solution and now using Heron formula in below. 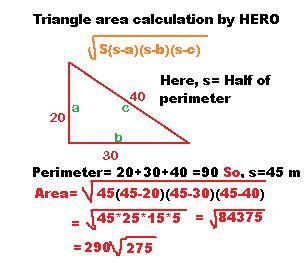 You are seeing the S which value is half of the perimeter of the triangle. Now look for the next question and answer. 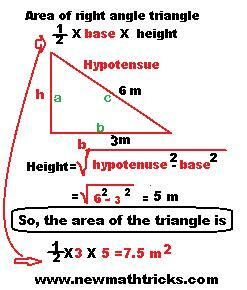 Question 3: A right angular triangle whose hypotenuse and the base are 6m and 4m respectively. Now find the area. Explanation: we know the area formula (1/2)*base*height for caluting the area. But in this question height is unknown, though we know the hypotenuse and base. So we need to find the height. As you have seen in the tutorial of triangle mensuration formula that the Pythagorean theorem can be used to find the height. So, we used it to find and applied to solve the problem. And finally used the formula (1/2)*base*height. We will post more question and answer on the triangle. Now, you may visit chapters-wise arithmetics math tricks or more mensuration formulas from here. How to Calculate Age quickly and easily? Shortcut apptide fomula for profit and loss chapter for competitive exam. Solved Arithmetics Questions of exam level Maths in Tricky Method.